At New Shanghai we pride ourselves on offering a range of authentic Shanghai style cuisine. From noodles and soups, to rice and vegetable dishes, there is something to please every palate. Don’t forget to try our specialty soup dumplings, which you can see being made in our dumpling theater! At New Shanghai, we believe in first impressions. Therefore, we asked our chefs to create a menu that you would remember. Choose from a range of light starters and begin your meal right. Seasoned Calamari, lightly wok fried to crispy perfection, garnished with fresh chillies. Savoury, deep-fried chicken wings tossed in an addictive sweet and spicy sauce. An East Asian classic, freshly steamed and sprinkled with ground sea salt. Deliciously glazed, our hand marinated beef ribs are tangy and sweet. A taste for your taste buds with the supple crunchiness of seaweed, marinated in spicy vinegar. A simple yet delicious treat! Cucumber shavings drenched in the goodness of garlic, served with sliced lemon. Boneless half duck with a crispy skin. Thinly sliced, marinated Shanghai style, and covered with our sweet soy sauce. Perhaps, there hasn't been a single feast on a table in Shanghai without a platter of dumplings on it. 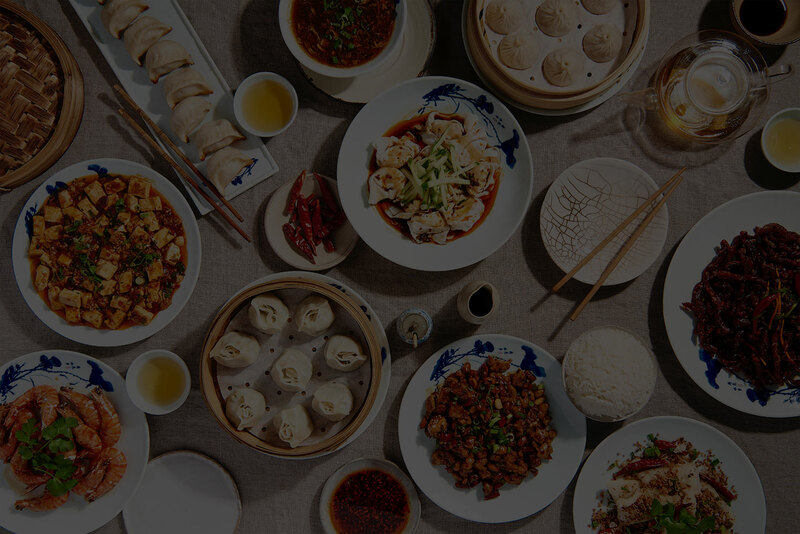 Order from our range of signature dumplings and delve into the taste of Shanghai. Straight from the streets of Shanghai - pan-fried chicken buns with a crispy base and a fluffy top. A twist on traditional chicken bun - these pan-fried crab and chicken buns will leave you wanting more. Dumplings filled with tender minced chicken, pan-fried to a glorious golden-brown. Dumplings filled with tender chicken and prawn mince, pan-fried to a glorious golden-brown. Who doesn’t love vegetables? Bok choy, carrot, dry tofu, and shitake mushroom, chopped and tossed in glass noodles. Steamed chicken dumplings served in a traditional bamboo steamer. Folded with love and bursting with flavor, these pockets of pure delicious will become a family favorite. A flavorful, airy mince of steamed crab and chicken parceled in beautiful dumplings that are served in a traditional bamboo steamer. Slow-cooked camel mince in your favorite dumplings, served in a traditional bamboo steamer. The staple of every Chinese household - the dumpling. Choose from a variety of fillings on our menu. Bite-sized dumplings filled with the perfect blend of tender chicken mince and crispy Chinese cabbage. A flavourful blend of chicken and chives packed neatly into your favourite dumplings. Take a heavenly bite of these dumplings for an earthy taste of lamb and leek. Bite-sized dumplings filled with beef mince and seasoned with coriander. Dive into these bite-sized dumplings with prawn filling. Served with Soy sauce for the perfect zing. Served in the traditional bamboo steamer, these steamed dumplings are every veg-lover's dream. Filled with Bok Choi, white turnip, dry tofu, mushroom, and glass noodles. Dim sum is more than a platter - it is the Chinese tradition on a table. It is a shared blessing enjoyed together. Order some for your whole family. An edible proof that 'less is more' - finely chopped spring onions kneaded into a light, airy dough. Shanghai approved rolls - bite into paper-thin crisps for an explosion of flavour. Tender duck in a sweet soy, sticky sauce, infused with the goodness of cinnamon and bay leaf. Served in steamed buns. They're called wontons because you're going to want tons of them. Go ahead, help yourself to a parcel. Chicken wontons soaked in the aroma of fresh vegetables. Served in chilli oil with a hearty peanut and sesame sauce. Handmade juicy beef wontons, Served in chilli oil with a hearty peanut and sesame sauce. Tender prawn wontons mixed with spring onion oil, Served in chilli oil with a hearty peanut and sesame sauce. A touch of spicy, diced chicken and tofu, served Shanghai-style with noodle soup. Seasoned with bamboo shoots and spring onion. A mouthwatering taste of beef shin, braised to perfection in the traditional Chinese way. Served with noodle soup. A deliciously clear soup made of wontons, that are flled with minced chicken and vegetables. A salad at New Shanghai is a complete meal -- not only do we ensure that our salads are balanced in taste, but also in nutritional value. Dig into one of our salads and begin your journey towards a healthy body, mind, and soul. Celery, cucumber, carrot, cilantro, and cabbage tossed in crunchy egg noodles, dressed with spiced peanut dressing. Your favorite salad with a Chinese touch! Flavored, shredded chicken tossed in a bunch of greens and drizzled with our special sweet and tangy sauce. Dive into one of out seafood entrées, as we lay the ocean before you. A whole Sea Bass fish, crisped to perfection, covered with our exceptional sweet and sour sauce. A sweet and savoury treat on a plate: King prawns wokfired to a royal crisp and served with Shanghai sweet sauce. King prawns coated in spiced batter, crisped and seasoned with a hint of garlic, shallots and fresh chilies. Fresh clams wok-fried with your choice of Ginger and Spring Onion Sauce or our homemade XO Sauce. A tasty blend of spiciness with a little bit of sweetness! Stir fried prawns with roasted peanuts and green onions in a tempting kung pao sauce. Meet the finest cuts of meat, prepared to satisfy all meat-lovers. Guangdong style spicy beef crisped to perfection. Served with a garnish of spring onion, carrots, and dry whole chilli. Tender beef, sliced and wok-fried in a rich and savoury Mongolian sauce, served on a sizzling plate. A Southern Chinese classic: the finest cut of lamb, slow-braised until tender. Served with sweetened soy sauce. Beef brisket, slow braised and infused with ginger and onion. Served with a glaze of sweet soy sauce. Chinese cuisine treats chicken like royalty - the preparation is a matter of delicate measurement, fine cutting, and timely cooking. Try our poultry menu and enjoy. A traditional Sichuan-style dish featuring chicken, peanuts, vegetables, and chili peppers with our unbeatable Kung Pao sauce. Enjoyed best with steamed rice. Spice up your day with the Szechuanese classic cubed chicken in Szechuan sauce, Szechuan peppers, and dry chilli. Wok-fried chicken, topped with pineapple, red and green pepper. Served with sweet and sour sauce. Simple but rich – a quarter chicken with a perfectly crispy skin. Served with a homemade chili sauce. Sliced duck nestled within steamed lotus leaf buns, cucumber and spring onion shavings. Served with soy and hoison sauce. Chinese cuisine is special for its treatment of produce. Every piece of vegetable is prepared distinctly, to maintain texture and taste. Order from our vegetable and tofu menu, and fall in love with greens again. Ground peanuts in chili bean sauce and vegetable stock, slow-cooked to a rich blend. Served with chopped tofu. A stir-fried concoction of spinach leaves seasoned with a mixture of garlic and salt. A combination of broccoli, Chinese broccoli, baby corn, carrots, snow peas and wood ear mushrooms, seasoned with your choice of oyster or garlic sauce -- well worth the wait. Tofu battered and Deep-fried to a radiant golden, served with garlic, spring onion, shallots and chilli in a salt and pepper mix. A tempting blend of braised tofu, Chinese black mushrooms and Shanghai bok choy served in light oyster sauce. The must-have in Chinese cuisine and global favorite. Get your own bowl and dig into it. Flat rice noodles served with sliced beef and seasoned with both soy sauce and dark soy sauce. A Beijing signature, full of flavours and freshness. Ground marinated chicken with a fragrant sauce served on a noodles base. Whether you like your rice white and fluffy or caked, we have them all. Enjoy this hearty meal of rice cake, yummy chicken and spinach in XO sauce. Shrimps, turkey and mixed vegetables tossed in XO fried rice. The classical Chinese-style wok fried rice with shrimp, turkey, and a mix of chopped vegetables. Wok fried rice with a load of shrimps and vegetables. Fluffy, steamed rice – available in white and brown.